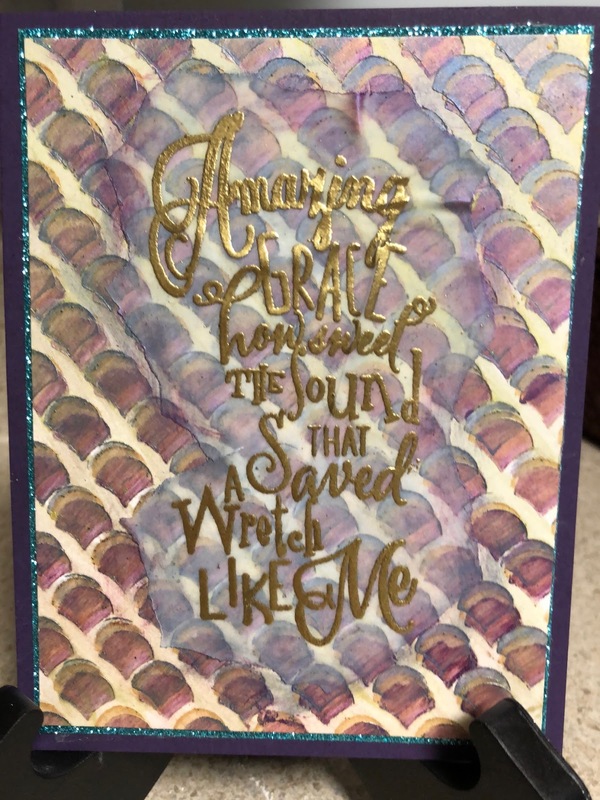 I used gold Art Nuvo Mousse over a sheet of card stock embossed with an embossing folder. 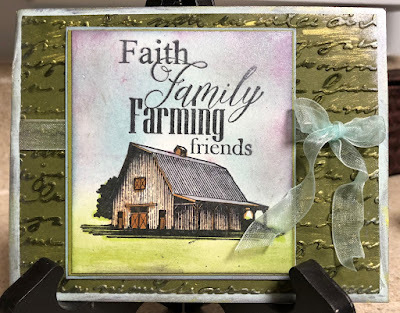 I used Copic markers to color the the barn, and the grass is sponged on as is the sky. Have a wonderful day and be sure to get inky! Please remember your 10% discount by using the code TJ10Judy. Have a terrific day -- and make it an inky one! 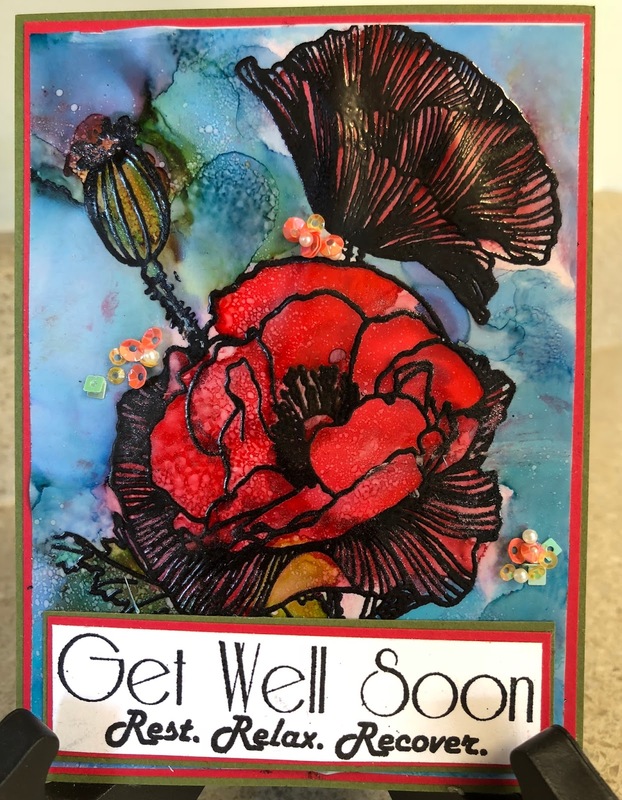 I used Yupo paper for this card I used alcohol inks on sponge daubers to color in the flowers and the background. It was sort of an experiment. The Technique Junkies Stamps I used are Poppy Bouquet - www.techniquejunkies.com/poppy-bouquet/ - and Grand Greetings - http://techniquejunkies.com/grand-greetings-set-of-5/ . If you don't have this set of greetings stamps, please consider buying it. There are five stamps and five really nice greetings for various occasions with lovely fonts! Please remember to save yourself some money (always nice!) by using the code TJ10Judy -- you will save 10%! Have a great day and be sure to get inky! http://techniquejunkies.com/amazing-grace/ - and is heat embossed with gold embossing powder on vellum. I tore around the verse and ran the vellum through my Xyron machine to place adhesive on the reverse side. Remember you can get A 10% discount by using the the code TJ10Judy when placing your order from the Technique Junkies website! http://techniquejunkies.com/just-wing-it/ . The skin, eye brows, and eyelashes are colored with Copic markers. Then I used the same lovely shimmery NuvoMousse colors to add eye shadow -- so fun! 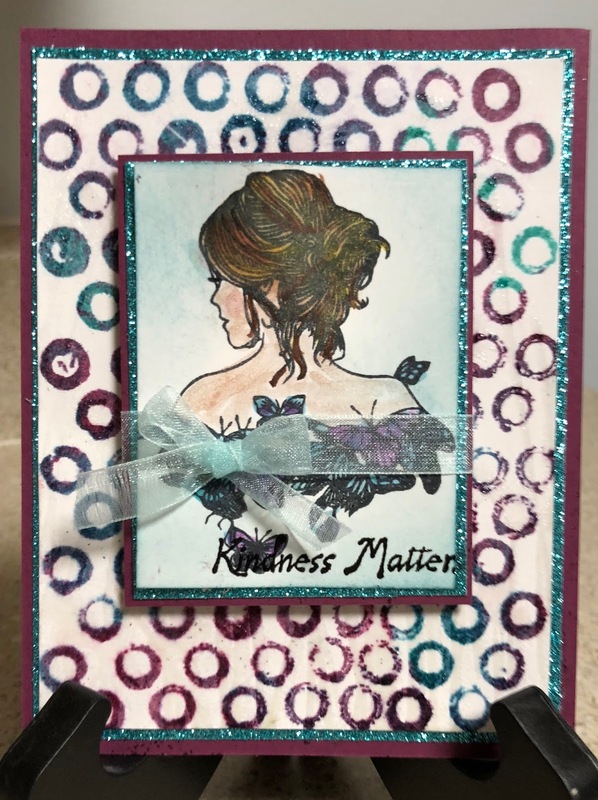 I have this lovely fringe yarn in my collections and thought the shades were just perfect for this feminine and frilly card. 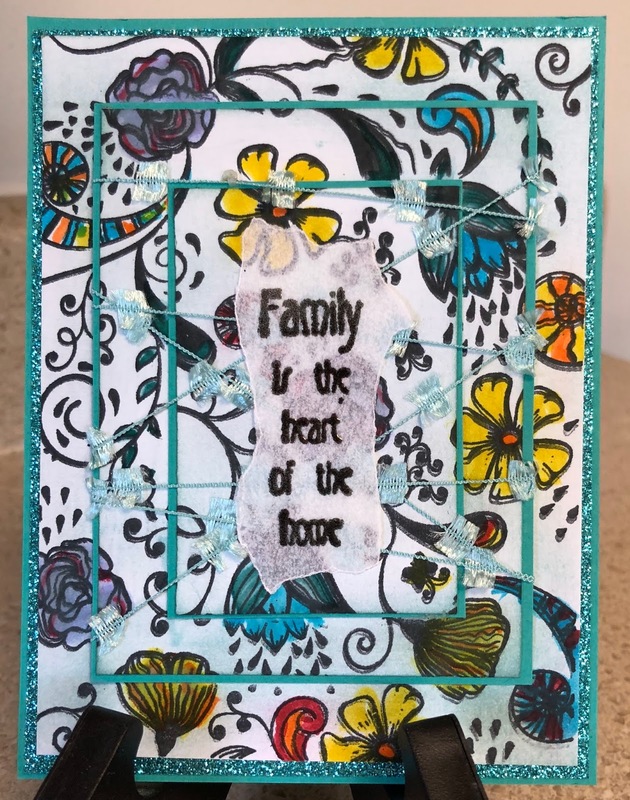 I had fun creating this card and hope you like it! 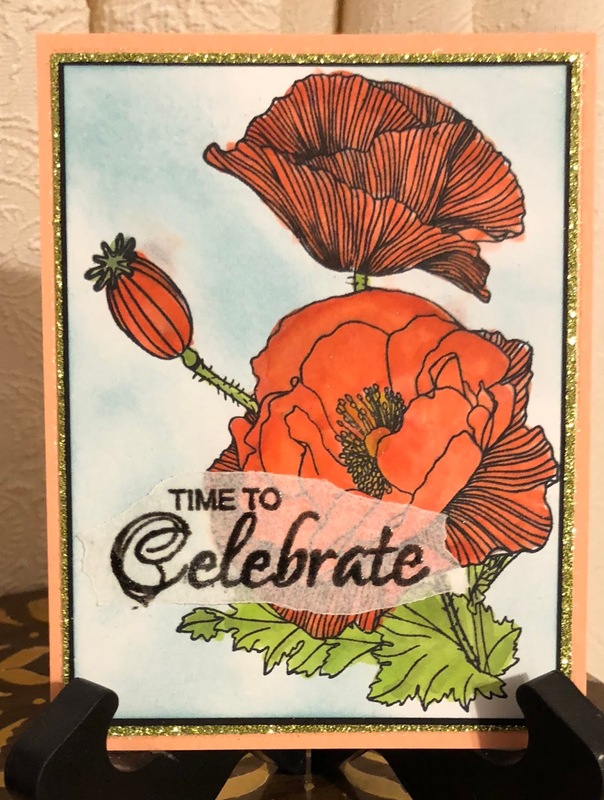 Please remember to use TJ10Judy to get a 10% discount on all stamps and products not already on sale on the Technique Junkies website - http://techniquejunkies.com/ . Have a terrific day -- and get inky!! Isn't this cute! This would be a cute, cute graduation card! Or a birthday card! Or a congrats card for retirement, a special occasion, etc. I used Copic markers to color the image and sponged the blue sky. 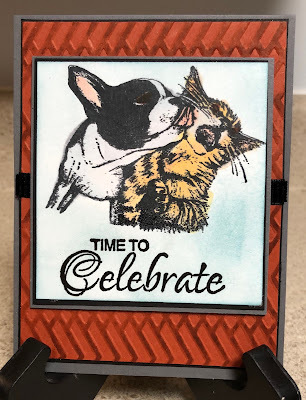 The Technique Junkies stamps stamps used are The Kiss - http://techniquejunkies.com/the-kiss/, and Time to Celebrate - www.techniquejunkies.com/time-to-celebrate/. Please be sure to use the the code TJ10Judy to get a ten percent discount on the Technique Junkies website! Have a great idea -- and get inky!! 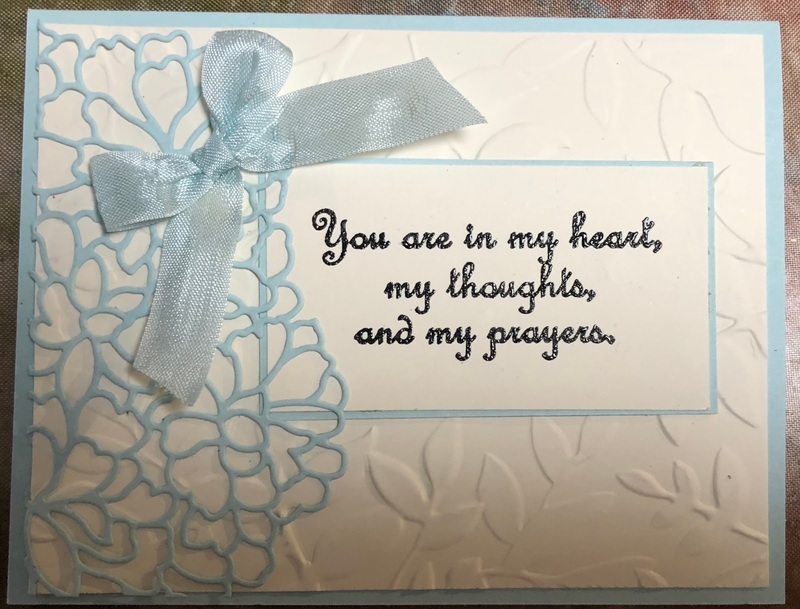 This is a very simple sympathy card. 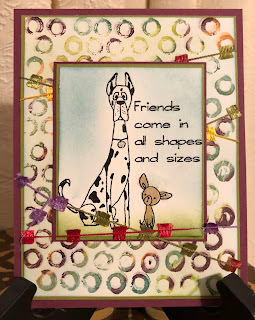 I used an embossing folder and a die card for the main features. Both of these are from Stampin' Up! 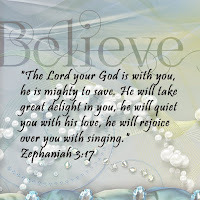 The verse is stamped and embossed and is from Our Daily Bread. I am in the last days of being Florida for the winter and will be heading back to Pennsylvania in about 10 days. And during this time I have had four families I have know for years and years experience the loss of a parent, a husband, or a sibling. So I have needed to create sympathy cards for these good friends. Such loss is always hard to deal with. Have a great day! And get inky! This card w as created with two new April Technique Junkies stamps and one older one. The stamps I used are: Butterfly ;Woman - www.techniquejunkies.com/butterfly-woman/; Stencil Rings - www.techniquejunkies.com/stencil-rings/; and Kindness Matters - http://techniquejunkies.com/kindness-matters/ . Butterfly Woman was colored with Copic markers. The Stencil Ring stamp was colored with dye based markers in a random fashion to give a variety of colors here and there. The words were heat embossed. Please remember that you can get a 10% discount by using the code TJ10Judy! - to create this card. 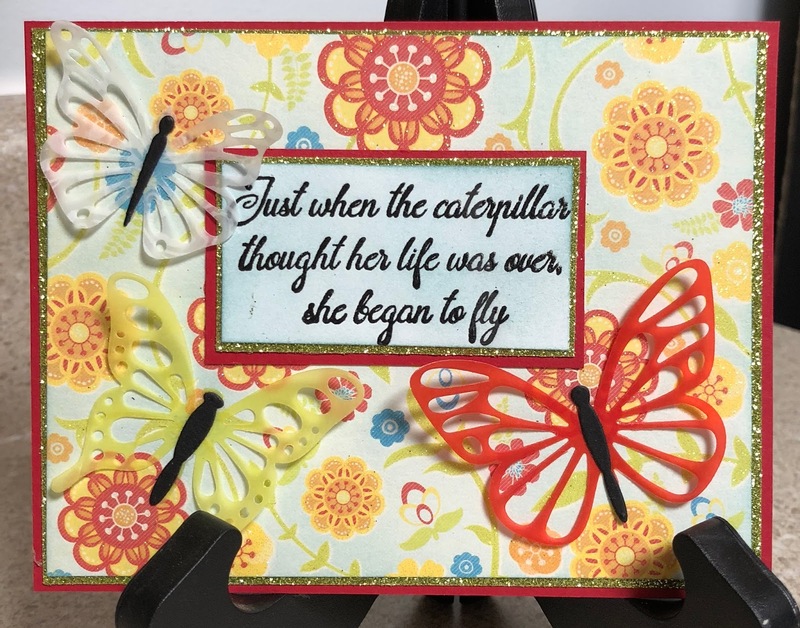 I used a brightly colored floral background paper and die cut butterflies from vellum as part of the focal images. There was glitter on the paper so I also used glitter paper to add layers with. Please remember to use the code TJ10Judy when you place an order. That will get you a 10% discount on everything that is not already on sale. Have a wonderful day -- and be sure to get inky! 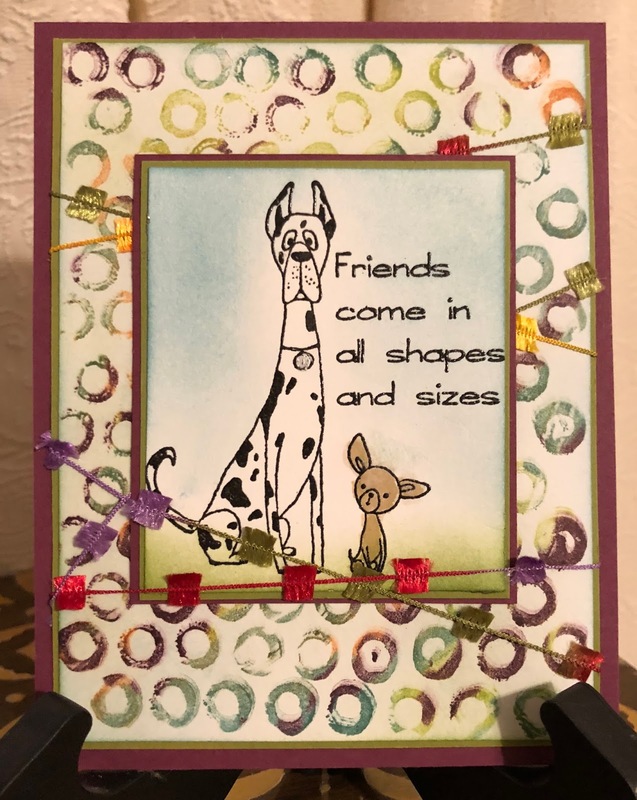 to create this card. I used Copic markers to color the image. http://techniquejunkies.com/heart-of-the-home/ - was stamped and heat embossed on vellum. It was adhered with adhesive from my Xyron machine. 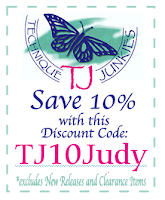 Remember you can get a 10% discount by using the TJ10Judy code. I added the verse on vellum and adhered it with my Xyron machine. 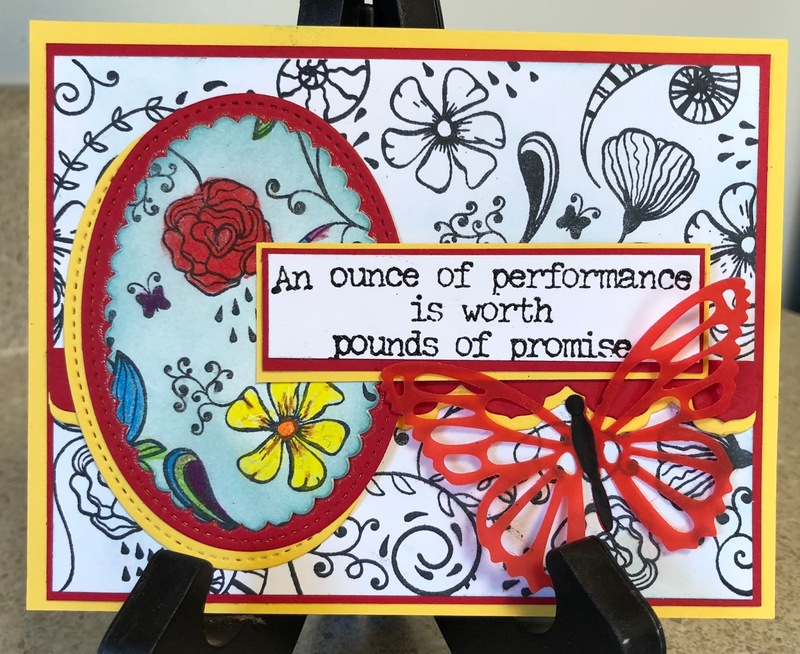 A ribbon and some glitter paper are the embellishments. Don't forget you can use the code TJ10Judy to get another 10% off any items not on sale. These two new Technique Junkies Stamps are just plain fun to use. I used All Shapes - www.techniquejunkies.com/all-shapes/ and Stencil Rings - www.techniquejunkies.com/stencil-rings/. The sky and grass are sponged. I used Copic Markers to color the image. The rings were colored with the broad brush of dye based markers. I inked the entire image with a pale green to start with, and then added other colors randomly several times. Please remember you have through April 8 to take advantage of the special 15% off discount of all newly released April Technique Junkies stamps. 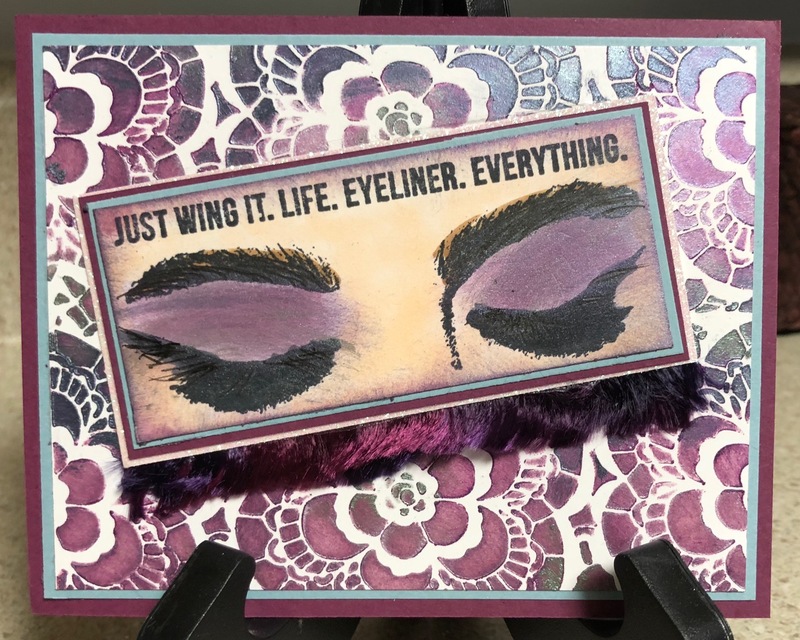 And you can get 10% off any time on any other non-sale item on the Technique Junkies Stamps website by using this code - TJ10Judy. I hope your day is great and you have time to get inky! 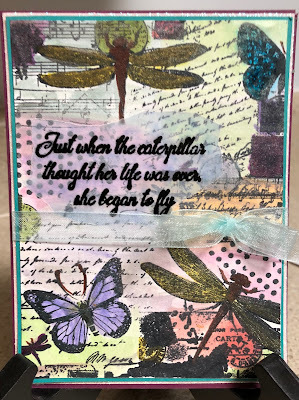 This lovely stamp is part of the new April Technique Junkies release - www.techniquejunkies.com/april-2018/. All of these stamps are on sale through April 8 for 15% off which is figured automatically -- no code needed! The stamps I used at Poppy Bouquet - www.techniquejunkies.com/poppy-bouquet/ - and Time to Celebrate - www.techniquejunkies.com/time-to-celebrate/. 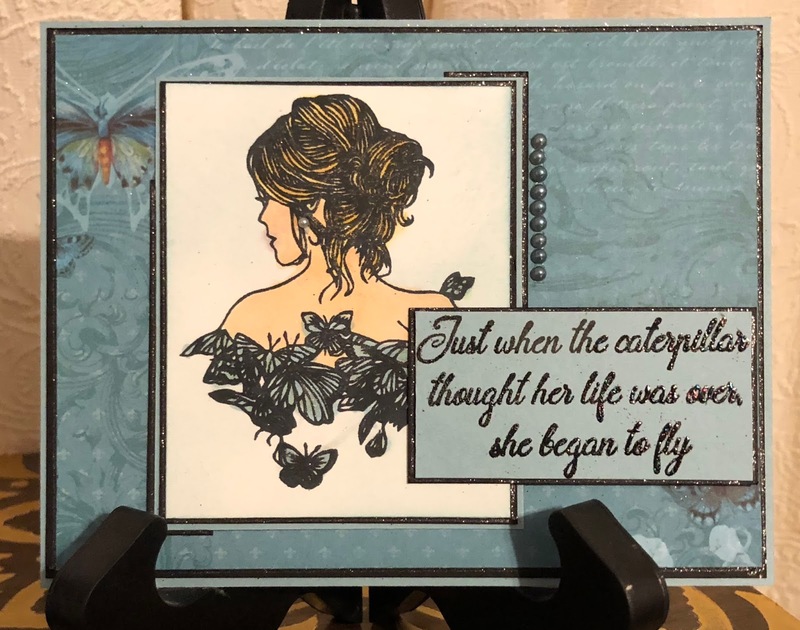 The image is colored with Copic markers and the verse is heat embossed with black detail embossing powder. The verse is on torn vellum and adhered with adhesive from a Xyron machine. The sky is sponged in. You can save another 10% on everything else (not on sale) with the code TJ10Judy. 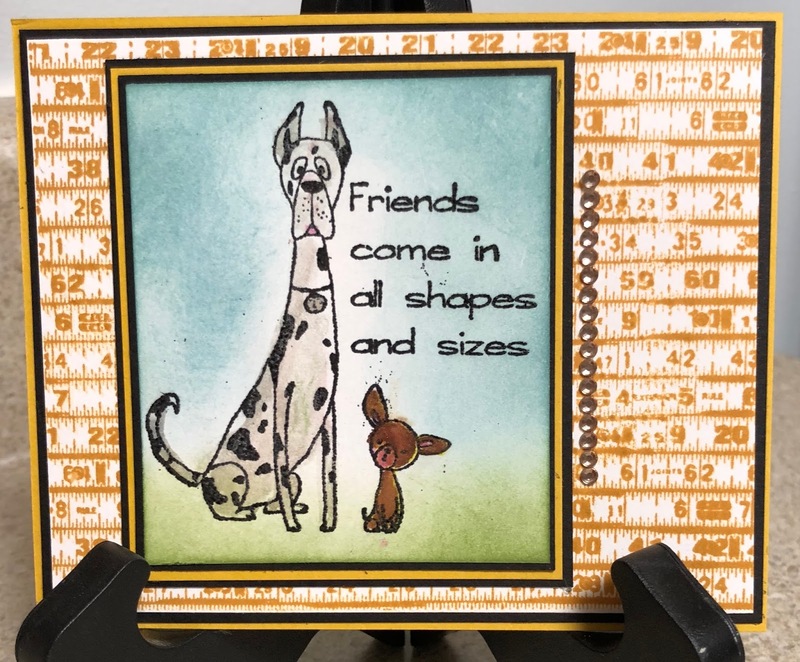 Please remember that through April 8 all of the new April Technique Junkies release - www.techniquejunkies.com/april-2018/ - are on sale for 15% and all other stamps and supplies can get a 10% discount by using the code TJ10Judy. Have a happy stamping day and get inky! Oh Joy! Oh Joy! Happy April and Happy New Stamps! 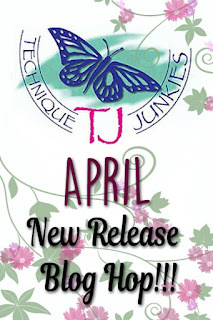 In case you didn't realize it by now, this is Technique Junkies Release Day! We have 15 new stamps for you to drool over. 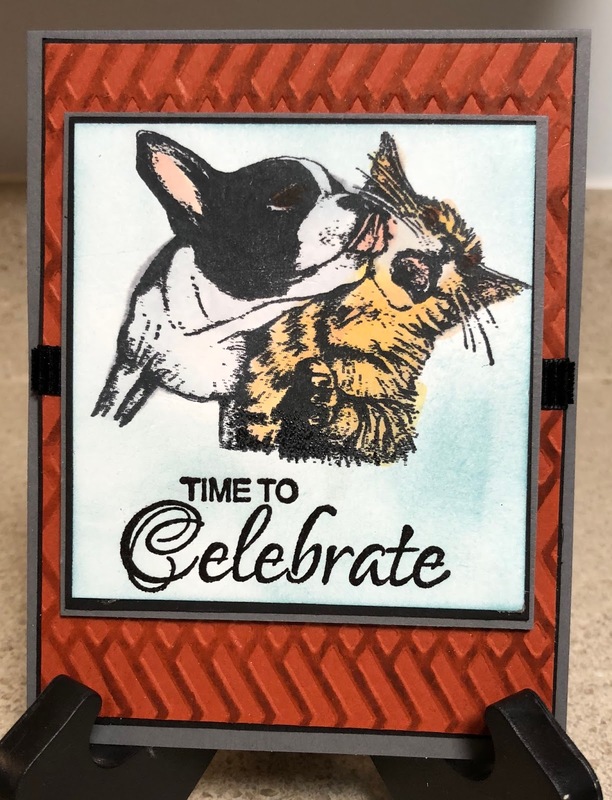 www.techniquejunkies.com/april-2018/ All members of the Technique Junkies Design Team have wonderful projects to show case these new stamps! And to help entice you with saving some money, all new Technique Junkies release stamps are 15% off through April 8. And if you didn't start at the beginning of the blog hop start at this spot: https://techniquejunkies.blogspot.com/2018/04/technique-junkies-april-release-and.html . 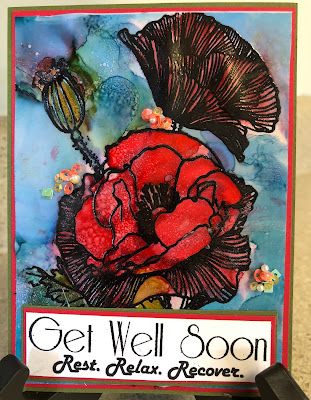 All of the stamps used today are Technique Junkies Stamps. My first card uses Butterfly Woman - www.techniquejunkies.com/butterfly-woman/ - and Began to Fly - www.techniquejunkies.com/began-to-fly/. The image is colored with Copic markers. The verse is heat embossed with detail black embossing powder. 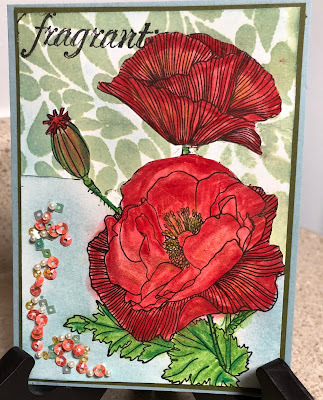 My second card uses Poppy Boquet - www.techniquejunkies.com/poppy-bouquet/ - and one word from one stamp in the great collection called Sentimental Sayings - http://techniquejunkies.com/sentimental-sayings/ . I used Prisma Color pencils and rubbing alcohol to blend. The background is created with glimmer spray and a Colorful Life stencil - http://techniquejunkies.com/a-colorful-life-stencils/ . My last card uses the new All Shapes - www.techniquejunkies.com/all-shapes/ - and Measure Up - http://techniquejunkies.com/measure-up/ . The image was colored with Copic markers. The sky was sponged with blue. Next please go to my talented team mate Beth Norman's blog - http://www.sunflowers-dragonflies.ca/blog/60343/technique-junkie…release-blog-. hop/ . I hope your Easter is filled with Resurrection Joy! And inkiness!